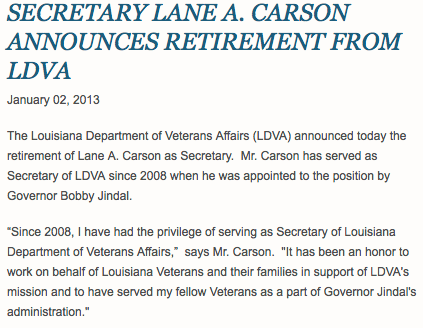 Lane Carson has been serving as the Louisiana Secretary of Veterans Affairs since 2008 and is now set to retire. I’ve had the pleasure of getting to know Lane over the years and want to thank him here, for a job well done and for his continued service to our country. Lane was wounded in Vietnam ans holds a Purple Heart. I doubt he will ever really retire from helping veterans, because it is what he does. He lives locally to me and actually used to live in my neighborhood before we moved in. I hope I see him around, enjoying life and retirement!